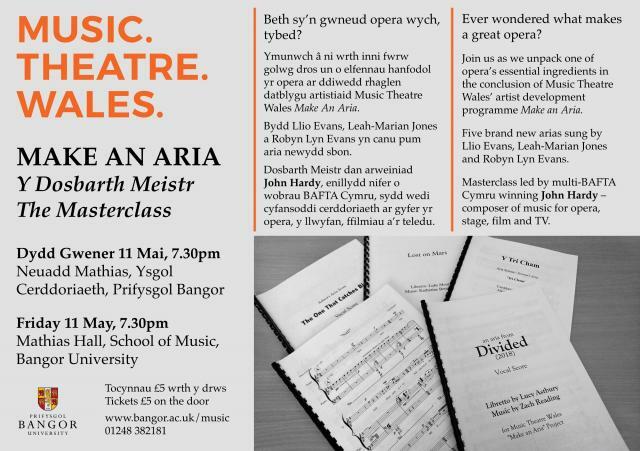 Over the past year, five School of Music students - Katherine Betteridge, Ellie Brooke, Tom Hughes, Alistair O’Mahoney, and Zach Reading - have been working with Music Theatre Wales and librettists from the Schools of English Literature and Welsh on composing five new opera arias. The fruits of this project will be performed by professional singers in a public masterclass on Friday 11 May at 7.30pm in Mathias Hall. Tickets cost just £5 and are on sale now at the link below. Numbers are limited!